Previous presidents faced protests like the “yellow vests” who rampaged through Paris. As before, the supposed cause – fuel taxes – masks other grievances. But Emmanuel Macron lacks heavyweight ministers or credible opponents. That makes him a lightning rod for public discontent. 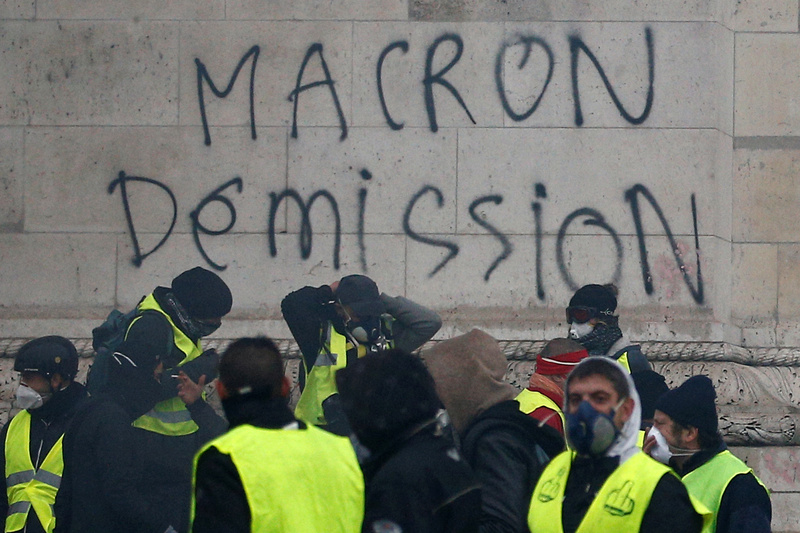 The message "Macron Resign" is seen on the Arc de Triomphe as protesters wearing yellow vests, a symbol of a drivers' protest against higher diesel taxes, demonstrate at the Place de l'Etoile in Paris, France, December 1, 2018. Rioters ran amok across central Paris on Dec. 1, torching cars and buildings, looting shops, smashing windows and clashing with police. In Paris, police said they had arrested almost 300 people while 110 were injured, including 20 members of the security forces. The escalation in violence came after two weeks of nationwide protests against fuel taxes and living costs by the “gilets jaunes” or “yellow vest” movement, named after the fluorescent jackets kept in vehicles in France.